Australia has missed out on a top ten ranking for information technology factors and related areas, according to a global innovation index that looked at 84 different indicators in 142 economies to determine which was the most innovative. South Korea, Singapore, Hong Kong, the Netherlands and United Kingdom took the top five spots in the GIobal Innovation Index 2013 information and communication technologies ratings, followed by the United States, Germany, Sweden, Norway and Israel. Australia was at number 13 in the world, rated ahead of Denmark but behind Finland. New Zealand was ranked 21st. On the information technology and communications side, Australia was said to be strong in online e-participation and creativity. Its knowledge workers and the number employed in knowledge intensive areas was also listed as a strength, along with local research and development and the number of top-level domains on the internet. 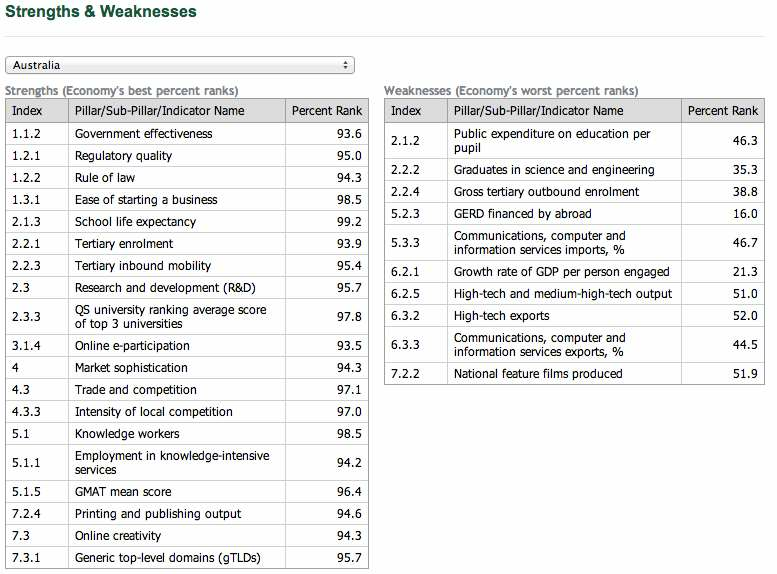 However, GII 2013 found some of Australia's weaknesses included ICT areas such communications, computer and information services imports, and low high-tech and medium-high-tech outputs and exports. When it came to ICTs and business model creation, Australia didn't break into the top twenty at number 27 in the world, GII 2013 found; whereas Singapore, Ireland and Switzerland led the high-tech and medium-high-tech output rankings, Australia was way down in the charts at number 48. The rankings for Australia were worse for high-tech exports, where the country was beaten by New Zealand in the 59th spot, followed by Guatemala, Montenegro and the Republic of Moldova. Online creativity that counts generic and country-level domains, along with Wikipedia edits and YouTube uploads had Australia at number nine, before Hong Kong and after Sweden. Iceland was the top-rated country for online creativity, according to index. Globally, Australia was placed at number 19 in the complete GII 2013 rankings, with a score of 53.1 and a percentage rank of 18.4. This placed it ahead of France (52.8/56.0) but behind South Korea (53.3/33.3) and New Zealand (54.5/36.8). Last year, Australia was ranked at number 23 globally, and New Zealand at 13. Hong Kong, Singapore, New Zealand, South Korea and Australia were the top five countries in the South East Asia and Oceania region this year when all factors were included. The Global Innovation Index is published by Cornell University, the INSEAD Business School and the World Intellectual Property Organisation.